Beautiful! LOVE the green, purple and yellow. Purple, green and gold…looks like Mardi Gras to me. My new favorite! I used to hate it but for some reason, I can't get enough of it now! Love the photo! Heavenly. My all-time-single most favorite food. Beautiful capture! It seems you have the knack for photos as well as for cooking in the kitchen. Another example of food as art - absolutely beautiful. 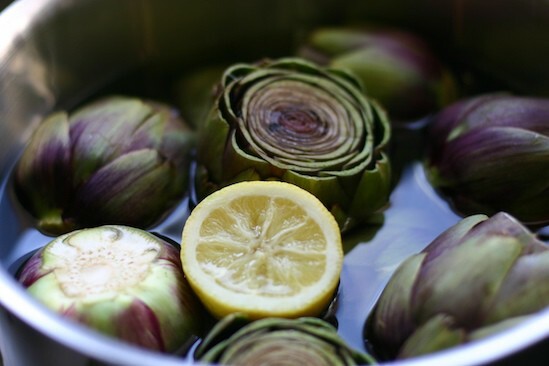 Gorgeous artichokes! I'm jealous, most of what I see in the groceries around here are kinda bruised and browned. You do have the gift of using the camera just right! Lovely photo, Nicole. I wish we got artichokes here! My favorite veggie ever, and a exquisite photo..
Not only does this picture look as appealing as the real thing, it is beautifully taken! I love getting my pound of veggies a day!